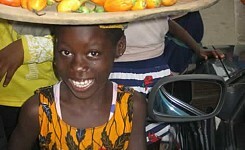 The Glory of Ghana: The town of Ho is the home base for your Globe Aware program. Ho is the capital of the Volta region, a city close to some of Ghana’s most beautiful natural treasures. 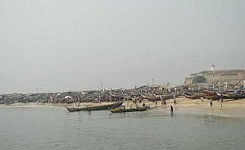 This is the ancestral home of the Ewe people. Sites you’ll explore in your free time and through organized activities include a famous Kente weaving village and open market, the tallest mountain in Ghana, the largest waterfall in West Africa, and more. Globe Aware works with a local grass roots organization which seeks to help fellow Ghanaians improve conditions of the vulnerable and deprived through education and other integrated rural development programs. Their mission is to assist rural and urban dwellers in times of natural or man-made disasters by positively impacting education, health, environment, empowerment of women, and through cultural diversity programs. Most of your time will be spent in one of the nearby smaller rural communities. There are about 45 different villages in which we work, all within about 40 miles of Ho. 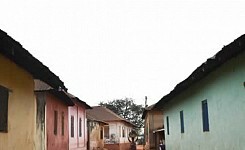 The beautiful area, combined with the history of the Ewe people of Ghana, make it a place many never want to leave. But despite the natural beauty, Ho and surrounding communities are facing a variety of challenges ranging from lack of clean water in rural areas to a workforce untrained in the use of modern tools such as the internet, something many there view as a necessity if Ghana is to progress. 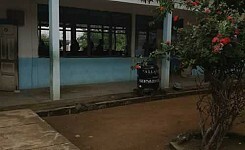 Nor are there currently enough teachers or facilities to offer free education to all children, many roads are not paved and the republic is still heavily dependent on international financial and technical assistance. This is a lovely place to offer your much-needed hand, for, as Lonely Planet writers state: "If an award were given for the country with the friendliest people in West Africa, Ghana would be a strong contender... you'll swear the wind and waves off the Gulf of Guinea have infused the land and people alike with equatorial warmth." 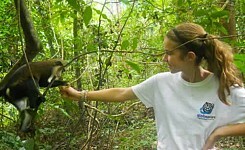 Globe Aware volunteer vacations to Ghana -SIGNUP NOW! Volunteers will work with a locally organized group but with projects in numerous surrounding villages. Projects are focused on the support of rural communities through a variety of objectives chosen by the local community. With larger groups, these projects include the building of school blocks for kindergartners, instruction, or improvement of washrooms and facilities that the children use (often times current conditions are extremely unsanitary.) Most of your time will likely be spent on one of the nearby smaller rural communities for whom you will be helping meet the hygiene needs as part of our Water Sanitation and Hygiene Project. Efforts in Ghana have a great deal of support in the local communities, and volunteers will be cherished and appreciated as they help the people of Ghana, on projects that are important to them, and learn to see and experience their culture in a way that few rarely ever do. Volunteers are settled together in large home stay facilities in the community in which we are working. Accommodations usually include running water, showers, flushing toilets, and some access to electricity (enough to recharge digital cameras, but the government has instituted rolling blackouts). Hot water cannot be relied upon but is occasionally available. Some of the needier communities in which we work only have access to scoop showers; if this is an urgent issue for you, please check with us ahead of your program. Traditional and delicious Ghanaian meals served to you will include specialties such as Jollof rice (rice, tomatoes, spices, with beef or vegetables) and a variety of other fish, fruit, and vegetables. Ghanaian food is perhaps surprisingly spicy and diverse. There's something delicious for everyone, and for the adventurous the local dishes like Banku and Fufu offer a very unique culinary experience. Bottled or boiled water is provided. 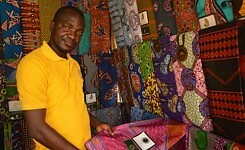 We visit the largest waterfall in West Africa and learn about Ghana's unique Kente tradition of weaving, the "cloth of kings." You will experience African dancing and drumming lessons. You are likely to playing futbol with other volunteers and community members. We make a visit to the old colonial town of Amedzofe, where you can take in the view from the tallest mountain in Ghana. You'll have time to explore all this and enjoy the people of the Volta region as part of your free time and in organized activities. You can choose to watch butterflies, go fishing, and almost certainly participate in some dancing in the streets. You will also become part and parcel of a slower pace of village life. Globe Aware representatives will meet you at our meet-up location at a central hotel in Accra at 11:00 AM the first Saturday of your program. From the airport, it is roughly a $5-$10 USD taxi ride. The drive to Ho will take around 3 hours. At the end of your week, we will drop you off in central Accra. It is the responsibility of the volunteer to get themselves back to the airport from there. Please do not book flights out of Accra earlier than 11:00 AM. Ghana is a safe and stable nation. Cast aside all the prejudices and stereotypes you might hold about Africa. Ghana has never fought a war. Incidents of crime are very low outside of Accra and Kumasi, the two major cities. At independence, Ghana had huge currency reserves and, in the eyes of many world economists, a very bright future. But Dr. Kwame Nkrumah, the first president and independence hero, along with his supporters, spent a lot of the money helping other African nations gain independence. Ghanaians aren't angry but rather proud of that legacy. 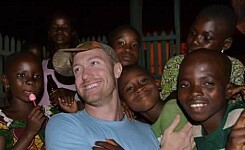 That spirit is alive and well in Ghana and, especially if you're coming from a large or midsize American city, you're likely to feel as safe as or safer than home while you're having fun and helping people. But, as always, you should exercise caution. VERY IMPORTANT. A yellow fever vaccination and the accompanying yellow vaccination card signed by the office that provided the vaccine are required to enter almost all African nations.